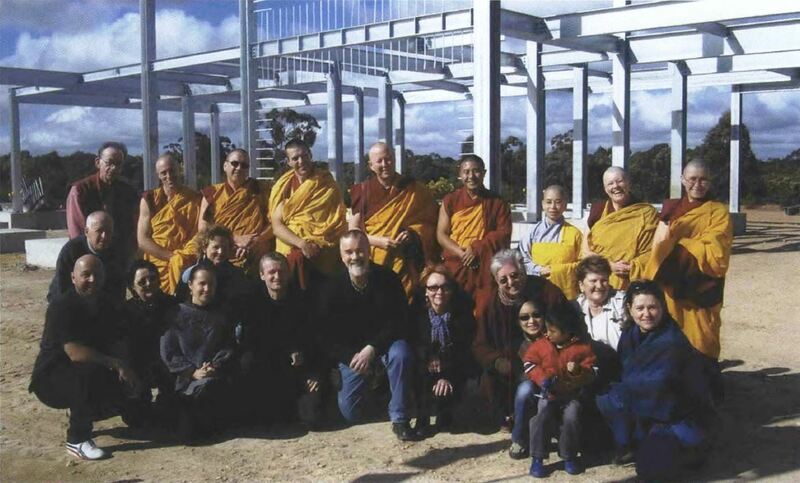 Sangha and students in front of the framework for the Great Stupa. Our view of reality is formed by what we see around us – which is why in every culture and every tradition mankind has used architecture to express what is important to us. In Western culture, our external and internal reality used to be very different. Traditionally, the most imposing architectural statement in any city was the cathedral or church perched on a hill. Today, by contrast, our landscape is dominated by symbols of power and competition. We are impacted by the importance of commerce in the form of towering skyscrapers and vast shopping malls. The glory of sport, our secular religion, is trumpeted by our massive sports stadiums. And the individualism of our lifestyles is demonstrated by suburban sprawl.